Known originally as the Pavelló Barcelona, this precocious little marvel was designed in 1927 by Mies van der Rohe (1886-1969) for Germany’s exhibit at the 1929 International Exhibition. All the other pavilions were built to house exhibits to show off national accomplishments. The Pavelló Barcelona had no discernible purpose besides providing a spot where the German delegation would receive a visit from the king. Mies once said, ‘I would rather be good than original,’ but here he was both. The flat roof of his sleek horizontal flat roofed hall of stone, chrome and glass was supported by columns, allowing the internal walls to be moved (being a stickler for quality materials, Mies had them made of Roman travertine, green marbles from the Alps and Greece and golden onyx from the Atlas Mountains). Sited over a pair of reflecting pools, the barrier between indoors and outdoors, seems to dissolve in a play of light and geometric form; to this day, it's a favourite 3D modelling project for architecture students. It slipped right past the attention of most fairgoers, although Barcelona’s more perceptive architects were intrigued, among them Rubió i Tudurí: ‘It just encloses space,’ he marvelled. The International School was well on its way, although few of the thousands of subsequent Modernist buildings could match the contemplative beauty and Zen quality of this little hall. For all its importance, the pavilion was demolished after the fair. 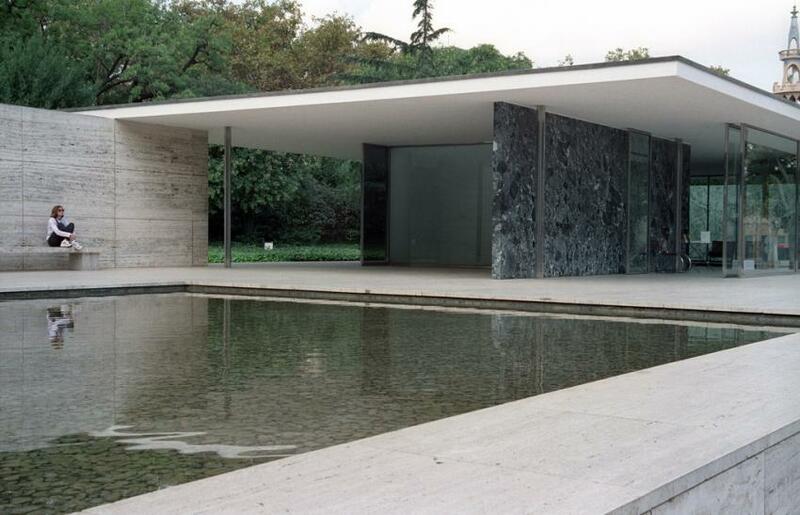 The exact replica was reconstructed by the Fundació Mies van der Rohe, set up by the Ajuntament in 1986 just for that purpose. Inside is Mies’ familiar metal and upholstered Barcelona Chair, so successful it's still made today. Over the inner pool is a bronze replica of the statue of Alba by Georg Kolbe, a contemporary of Mies. If you're feeling flush you can rent it out for a cocktail party. If not, there's a free 30 minute tour in English, Saturday at 10am. Note that occasionally the Pavilion is closed for a special event; check the website before setting out to avoid disappointment.